A unity sand ceremony is a wedding ritual that couples are now choosing to include in civil ceremonies. If you’re looking for something a little different to add symbolism to your wedding ceremony check out our short guide to the unity sand ceremony. The contemporary wedding sand ceremony is typically part of the main wedding ceremony, often happening just after the couple have been declared husband and wife. It is meant to be their first task together as a married couple. The exact origins of the ceremony are not well known, but it is thought that it was created either by Hawaiians or Native Americans, and that it signifies the inseparable nature of marriage. The bride and groom would each have simply gathered a handful of sand and thrown it into the air. The grains of sand would have merged, and would have been impossible to divide, signifying the couple coming together eternally in marriage. Step 1: A table is positioned at the ceremony venue with a large clear glass vase in the centre. This is often decorated or engraved with the wedding date and the couple’s initials or names. Step 2: Two smaller vases of different coloured sands, often in the wedding colours, are positioned either side of the middle vase, one for the bride and one for the groom. Step 3: During the ceremony the couple takes turns to add sand from their individual vases into the big vase, making a layered effect. A poem or reading can be read out load at the same time as the sand is poured. Step 4: In the end, they both add the remainder of the sand into the vase at the same time so that the two colours mix up and can’t be divided, signifying their unity in marriage. The central vase can be closed by using wax once the ceremony is over, and this creates a wonderful keepsake of your special day. 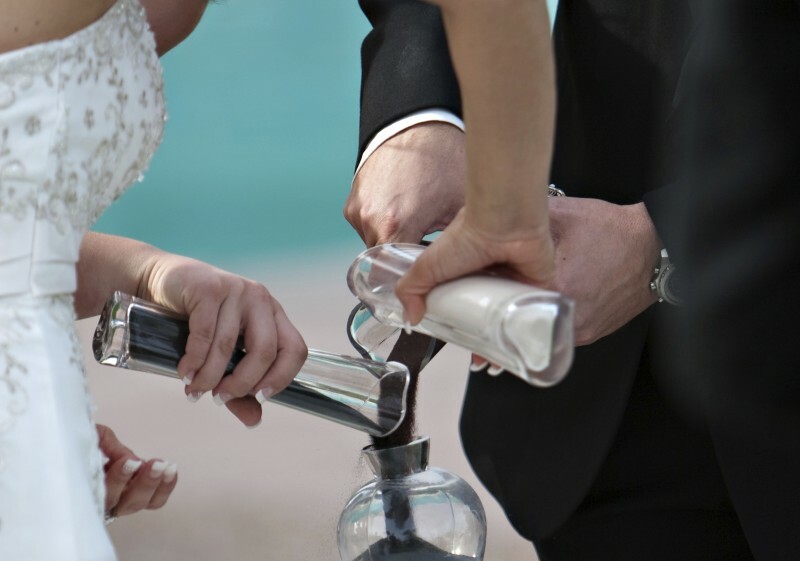 Wedding sand ceremonies are perfect for informal weddings, and work well for seaside weddings where some of the sand can be taken from the nearby beach giving it even more meaning. Wedding sand ceremony kits can be purchased with just about any colour sand. In this variation each set of parents has a vase with contrasting coloured sand. The parents take turns to add their sand into the big vase before the couple, representing their support of the couple in marriage. A parents’ variation of the sand ceremony is a good way to include the couple’s parents. In this variation each child has a tiny vase with coloured or white sand, and they add this into the big vase just before the couple finish adding in their sand. This generates a layer where the couple and children’s sands are mixed. The children can then add the rest of their sand on top of the couple’s sand. 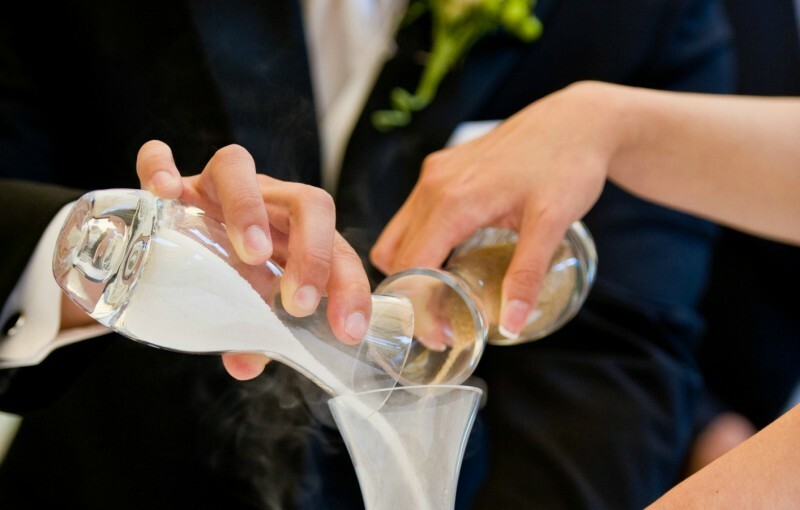 A children’s variation of the sand ceremony is best for couples that have children together already, or have children from a previous relationship. A Christian variation of the sand ceremony is available, where the big vase is one third filled with white sand prior to the ceremony. This signifies God and his role as a base for the couple’s successful marriage.